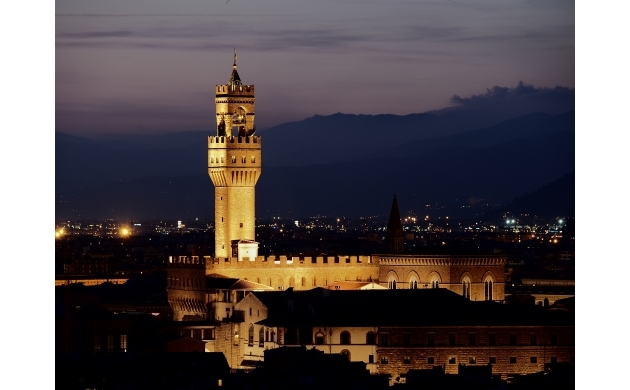 Palazzo Vecchio, with its typical medieval fort appearance, is located in Piazza Della Signoria and has always been a symbol of the civic power of Florence. The story of the name of Palazzo Vecchio is much discussed, but has always been tied to the government of the city. Originally called Palazzo dei Priori, it was re-baptized in the course of the 15th century with the name Palazzo Della Signoria, in honor of that organ of government of the Florentine republic. In 1540, after the triumphant return to Florence of Duke Cosimo I de Medici and the toppling of the republic, the name changed yet again to Palazzo Ducale. In those years, the Duke used the Palazzo as his personal residence where he lived until 1565 when he decided to move his court to the Palazzo Pitti. At this point, the name of the palazzo changed yet again, this time becoming Palazzo Vecchio. Palazzo Vecchio has since been the seat of the Parliament of the King of Italy and then of the city of Florence (the function of which it serves today) - however, since Cosimo I, the Palazzo Vecchio has not changed its name. The structure of the Palazzo Vecchio is very complex due its many rooms and levels which make up the building. At the lowest level of the building, the remains of a Roman theater were found during excavations in the year 2000. These remains can be visited today via an underground passageway. In Medieval times the city was covered with typical medieval-era tower homes. 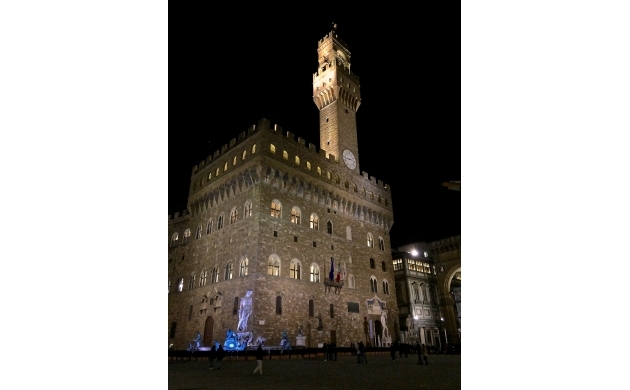 Above one of these towers the structure of the Palazzo Vecchio was begun in the 13th century at the hand of Arnolfo. In 1540, Duke Cosimo I commissioned the greatest architect of the time - Giorgio Vasari - to convert the Palazzo into a ducal palace in which his entire court could live. The Palazzo became the seat of the government and at the same time the residence of the governing family (whose private reserved area was the 'Quartieri Monumentali'). Under Vasari's guidance the Palazzo grew incredibly, especially when one considers the construction of the long passageway known as the Vasari Corridor, which connects the Palazzo Vacchio with Palazzo Pitti, over the Arno and the Ponte Vecchio. Visits to the Palazzo Vecchio begin just after the big entrance door, in the Cortile di Michelozzo, where it is possible to admire the very high tower of Arnolfo. Passing through the Cortile, we find the magnificent Salone del Cinquecento situated on the first floor of the Palazzo. The room takes its name from the assembly of counsellors to the Republic, numbering 500 after the reforms requested by Savonarola after the expulsion of the Medici by the Florentine Republic. The paintings on the walls, as high as 18 meters, were initially commissioned to Michelangelo and Leonardo, but were never finished. With the return of the Medici and Cosimo I, Vasari was hired to beautify the room, but above all to stop the works on the huge wall paintings that depicted the triumphs of the city of Florence in the battles over Pisa and Siena. Of all the statues hosted inside the room, the Genio della Vittoria by Michelangelo definitely shines. But the other gigantic statues that line the perimeter of the room, from Baccio Bandinelli, Vasari, and Stadano, are no less impressive. Closing the tour of the room, one finds a coffered ceiling made up of 39 panels painted by Vasari and his pupils which depict the most important episodes in the life of Cosimo I. 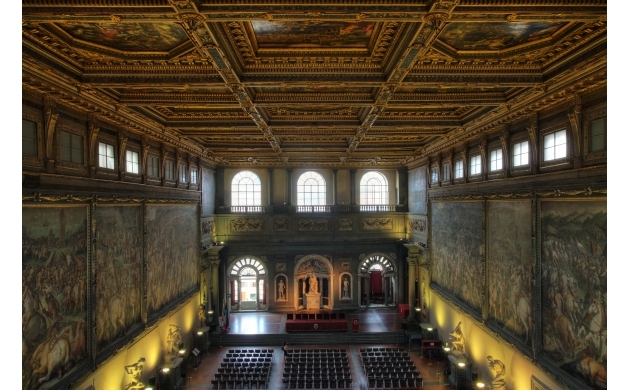 Somewhat hidden in regards to the size of the great room, there is the famous study of Francesco I. A small windowless room, it is entirely covered by painted paneled closets behind which are hidden small secret doors. On the second floor of the Palazzo Vecchio is the 'Sala degli Elementi' (Room of the Elements). This complex allegory represents the four elements - water, earth, fire and wind - through figures of classic mythology reinterpreted by Renaissance painters. The rooms follow one upon another through symbols of the planets and representations of the seasons and the months of the year, always calling to mind the ancient world of classic antiquity. But above all, there are the rooms dedicated to the underworld and the muses, which, on account of their esoteric symbolism, truly stoke the passions of the artists of Florence. It is not by chance that this part of the Palazzo closes with a terrace dedicated to Saturn: an open gallery looking out over all of Florence and from where it is possible to view Piazza Michelangelo and Piazza Santa Croce contemporaneously. The Maps Rooms takes us back down to the ground floor. In the middle of the room one finds an enormous globe, the "Mappa Mundi," accompanied by more than 50 geographic maps. In the 'Cinquecento' (the Italian Renaissance period of the 16th century), this room was host to the largest collection of maps of the known world. The Torre di Arnolfo closes this magnificent structure with its 95 meter height. Built by Arnolfo di Cambio above an old medieval torre, this tower dominates the city of Florence and constitutes a symbol of the government of the city. But the story of the tower demonstrates its true irony as it relates to its governed people. Along its 406 steps, just before the walkway from which it is possible to enjoy a breathtaking panorama over the entire city, one finds the most secret prison of Florence: the 'Albergaccio'. This is the cell where Cosimo the Elder was once was imprisoned and where Savonarola spent his final days before he was burned at the stake in 1498.